A preliminary analysis of the Goods and Services Tax (GST) data reveals that there has been a 50% increase in the number of indirect taxpayers, besides a large increase in voluntary registrations, especially by small enterprises that buy from large enterprises and want to avail themselves of Input Tax Credits (ITC), says a release. The Economic Survey 2017-18 presented today in Parliament by the Union Minister of Finance and Corporate Affairs, Shri Arun Jaitley informs that as on December 2017, there were 9.8 million unique GST registrants slightly more than the total Indirect Tax registrants under the old system (where many taxpayers were registered under several taxes). 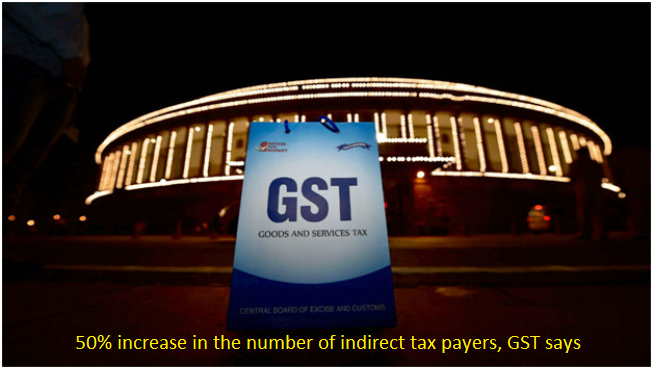 Therefore, adjusting the base for double and triple counting, the GST has increased the number of unique indirect taxpayers by more than 50 percent �a substantial 3.4 million. The profile of new filers is interesting of their total turnover, business-to-consumer (B2C) transactions account for only 17 percent of the total. The bulk of transactions are business-to-business (B2B) and exports, which account for 30-34 percent apiece. There are about 1.7 million registrants who were below the threshold limit (and hence not obliged to register) who nevertheless chose to do so. Indeed, out of the total estimated 71 million non-agriculture enterprises, it is estimated that around 13 percent are registered under the GST. Maharashtra, UP, Tamil Nadu and Gujarat are the States with the greatest number of GST registrants. UP and West Bengal have been large increases in the number of tax registrants compared to the old tax regime. It also underlines that the distribution of the GST base among the States is closely linked to the size of their economies, allaying fears of major producing States that the shift to the new system would undermine their tax collections. Dwelling on the subject of International Trade, Inter-State Trade and Economic Prosperity, the Survey points-out for the first time in India�s history that five States-Maharashtra, Gujarat, Karnataka, Tamil Nadu and Telangana account for 70% of India�s exports. New data on the international exports of States suggests a strong correlation between export performance and States� standard of living. Last year Survey had estimated that India�s Inter-State trade in goods was between 30 and 50 percent of GDP. But the GST data suggests that India�s internal trade in goods and services (excludes non-GST goods and services) is actually even higher and is about 60 percent of GDP. The survey based on new GST data also provides a close look at the firm-level exports and states that India�s exports are unusual in that the largest firms account for a much smaller share of exports than in other comparable countries. Export concentration by firms is much lower in India than in the US, Germany, Brazil, or Mexico. The top one percent of firms accounted for 72, 68, 67 and 55 percent of exports in Brazil, Germany, Mexico, and USA respectively but only 38 percent in the case of India. Similarly, the top 5 percent accounted for 91, 86, 91 and 74 percent in those countries, compared with 59 percent in India and the top 25 percent of firms accounted for 99, 98, 99 and 93 percent in those countries, as opposed to 82 percent in India. Referring to India�s formal sector, especially formal non-farm payroll, the Survey says it is substantially greater than currently believed. Formality defined in terms of social security provision yields an estimate of formal sector payroll of about 31 percent of the non-agricultural work force; formality defined in terms of being part of the GST net suggests a formal sector payroll share of 53 percent. The Chapter titled � A New, Exciting Bird�s-Eye View of the Indian Economy Through the GST� sums up that most of the discussions in the run-up to the GST centered on the size of the tax base, and its implications for the Revenue Neutral Rate (RNR). The RNR Committee had estimated a base of Rs.68.8 lakh crore and the GST Council had estimated a base of Rs.65.8 lakh crore. Current data suggest that the GST tax base (excluding exports) is Rs.65-70 lakh crore, broadly similar to these two previous estimates. Based on the average collections in the first few months, the implied weighted average collection rate (incidence) is about 15.6 percent. So, as estimated by the RNR committee, the single tax rate that would preserve revenue neutrality is between 15 to 16 percent.